Adding peanut butter to a foolproof batter takes pancakes to a whole new level. My original intent was to make plain liquid batter for pancake art. I probably should have paid more attention to the heading on the Allrecipes.com page, which advertised the result of the recipe as “delicious, fluffy pancakes” (hidden meaning: thick batter containing lots of baking soda). Instead, I honed in on the five-star rating and whipped up a double batch before even testing the consistency. While fluffy pancakes are great, the thick batter was not idea for shaping my pancakes into designs and faces. After lifting up a spoonful of the resulting mixture and watching it fall in long, viscous clumps back into the bowl, I realized that this was one of those cooking-in-college moments that required a “When in Rome” approach. I decided to make a second batch and divide it in half to experiment. To the first half, I added a bag of $1 Pillsbury brownie mix. To the second half, I dumped in a tablespoon or so of powdered peanut butter and a cup of chocolate chips I had brought home from Usdan. The brownie pancakes were decent, but in my opinion, they needed some tweaking to be worth making again. When fully cooked, they tasted like dry chocolate cake, whereas when allowed to remain gooey in the middle, they were a little more like crisped brownie batter. My guess is that the double dose of flour was what made the pancakes more bland than chocolatey, so I would recommend making the brownie mix by itself and pouring that into the frying pan rather than a combination of the two batter recipes. 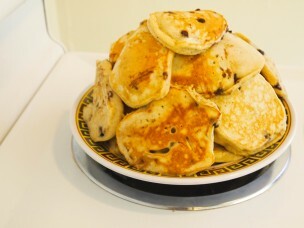 The peanut butter chocolate chip pancakes, on the other hand, were scrumptious, rich, and satisfying when cooked silver dollar-size (about 2” in diameter). For the first batch I made, I added plain powdered peanut butter and stored most of the pancakes in the fridge overnight; the next morning, they were chilled and slightly squishy, with a subtle peanut butter flavor offset by the crunch of the chocolate chips. Since I still had an entire doubled batch of plain batter to use up, I figured I would explore another variation of the peanut butter chocolate chip pancakes by stirring in powdered chocolate peanut butter instead of regular. Fortunately for my breakfast guests, this second version proved even more successful, a smooth blend of PB and chocolate enhanced by the melted chips. They were as filling as the last batch, so I’d suggest making these pancakes on the smaller side as well. Now, if you’re wondering how I wound up with powdered peanut butter in the first place, my mother is the one to thank. Although her care packages are usually clothing-related, her latest was probably an attempt to get more protein into my diet. Whatever the reason, the opportunity to improve my pancakes was much appreciated! 1. Mix together flour, baking powder, salt, sugar, milk, egg, butter, and vanilla. 2. Stir in the powdered peanut butter and chocolate chips until completely absorbed into batter. 3. Use a 1/3 cup measure to scoop clumps of batter onto a buttered pan over medium-low heat. Flip pancakes when tiny air bubbles start appearing in them. 4. Serve warm off the stove or chilled from the fridge.